Result: Denied. This owner can appeal to the City Council to have the decision overturned. After speaking to a historical renovation contractor, he said it is clear that the repairs to this house would be more in the 100K range rather than the 300K Ms. Ireland claims. Owners commonly make claims of excessive repair costs often in the HCDRC hearings. We have also seen owners exaggerate water levels in their home, which is why taking photos is important. This house is so historically significant, the value of the home would be triple the value of a modular once repaired. Owner Linda Ireland has applied to demolish this double side gallery shotgun single, to be replaced by a vacant lot. Ms. Ireland purchased this house, for $22,000 according to the assessment records. It would make much more sense to sell this than to demolish a very unique house, particularly where it is located, in the Broodmoore neighborhood which is dominated by more modern bungalow style homes. The home is an important part of the fabric of our world reknowned architectural culture. Many local preservationist have been concerned for months, that when demolitions began in earnest after the flood, that some people would be applying for unnecessary demolitions and due to the city’s stretched personnel resources, would be granted permission to demolish in error. Perhaps we can help prevent some of these demolitions by the work we are doing here at Squandererd Heritage. 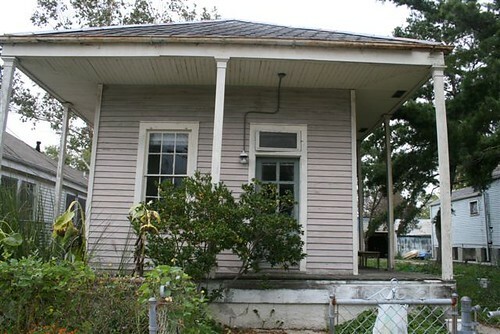 Many people are looking for housing to return home to New Orleans. This and the house Karen reported at 8525 Apricot could be refurbished and put back into commerce for much, much less investment than new construction. Usually, we Squandered Heritage photographers grab our gear and a portion of the-list-du-jour and head out to our respective parts of the city to try to cover as much territory as possible. Today, however, Karen and I had a few things we needed to do together. Karen showed me what will soon be the new Squandered Heritage World Headquarters, deep in the heart of Hollygrove. We also met with our friends at the Preservation Resource Center. We got a rare opportunity to do the site visit to this property together. I am very glad we did because I wouldn’t have believed my own eyes on this one, and we enjoyed exploring its wonderful character together. This is the second home this week we found that would be an unnecessary loss if demolished, we shared our concern. And remember, your comments can help us make a difference. Perhaps with the help of our readers, we can find a buyer for this stunning piece of history.